The Triogen TR2 Uv range is ideal for the treatment of koi ponds and significantly enhances water quality on a very cost effective basis. The Triogen TR2 Uv range has one to four high output, low pressure UV lamps can be incorporated within the same unit, providing a maximum flow capacity of 40m3/h with a powerful UV dose of 30mJ/cm2 at the end of the lamp life. The Triogen TR2 Uv range is highly effective against “green water” and inactivates single cell algae, allowing the aggregated debris to be removed by mechanical filtration. Additionally, the high 30mJ/cm2 dose provides an invaluable barrier against fish diseases by reducing the level of harmful bacteria, viruses and protozoa in the water, including Vibrio, Aeromonas hydrophilia and Koi herpes virus, by an minimum of 99.9%. 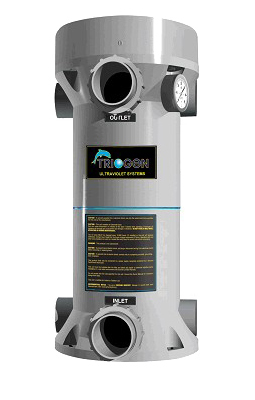 The Triogen TR2 UV treatment operates in an entirely beneficial fashion to the fish pond environment, passing no harmful by products into the water and allowing established mechanical and biological filtration systems to operate in their normal way. Sized to provide the stated UV dose - a factor of the internal UV intensity and water contact time - over the whole of the lamp life. All units are CE approved. The Triogen TR2 Uv range systems have a small footprint and low power consumption. The Triogen TR2 Uv are easily installed, having the unique advantage of selectable inlet and outlet positions to suit the pipework arrangement. The inlet and outlet unions on the Triogen TR2 Uv range allow easy connection onto existing or new systems and are supplied with both metric and imperial connectors. The low pressure UV lamps are powered by electronic ballasts which are weather protected within the reactor top cap. This makes the Triogen TR2 Uv range suitable for outside applications. All Triogen TR2 Uv units incorporate an external pressure gauge and an internal pressure switch which automatically turns off the UV lamps in a low flow condition. The semi-transparent centre ring allows visual confirmation that all lamps are operating correctly. Another unique feature of the Triogen TR2 Uv is that it is possible to add additional lamps and ballasts to an existing unit should extra treatment capacity be required in the future.